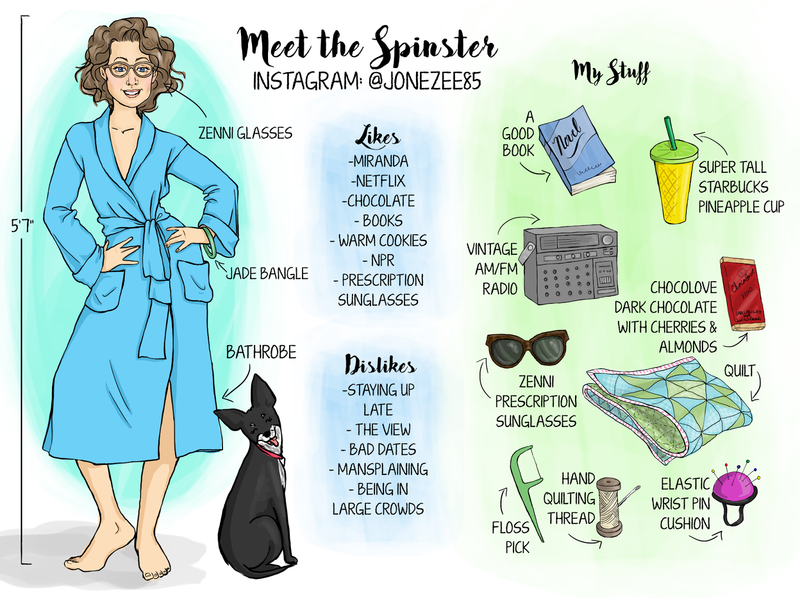 Ok, so I had so much fun with the "Meet The Artist" hashtag illustration yesterday, I thought I'd make one especially for The Spinsterhood Diaries. You may have noticed that the jade bangle is in both of these illustrations as well as most of my other self portraits. That's because it's very hard to get off - that's the way it's supposed to be. It's like a piercing, sort of, except my hand is the earring. I ordered this thing on eBay, and I love it. I know, I know. I can listen to the radio on my computer, but I like the sound of the actual radio better. - Chocolove: you just gotta try this. One of the truly life-changing purchases I've made. Since Zenni glasses are so affordable, this was the first time I actually got around to getting them. This is a must for all my fellow four eyes out there. Now that I've started quilting, I can't stop. I always want to be working on one. Obsessed. In the past year I've started flossing in the shower while I condition my hair. I think floss picks are infinitely easier than regular floss. I think I bought this for $3 or something when I was in fashion school. All the Korean girls had them, and once I got one, I knew why. You never have to worry about dropping your pin cushion, losing it, or having to turn around or search for a pin. It's right there on your wrist. Ok, so that wasn't really everything in the illustration, but those were the ones I thought needed explanations.